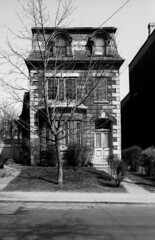 There are a wonderful set of Toronto historic photos available online, here are all the photos that I could find from around the Cabbagetown area in Toronto, Ontario, Canada. 1860 Toronto General Hospital (1856-1913), Gerrard St. E., n. side, between Sackville and Sumach Sts. 1954 Winchester Hotel aka Lake View Hotel (built 1888) - Parliament St., s.e. corner Winchester St.
1988 377 Sackville St - Built in 1876, Bryce & Hagon, Builders. A City of Toronto Heritage structure.